🕎 Hanukkah begins at sundown. Chag sameach! 🇺🇸 "The casket bearing the late president George H.W. Bush will arrive at the U.S. Capitol [tomorrow] evening and will be on public display as the 41st president lies in state in the Rotunda until Wednesday morning," per the WashPost. President Trump ordered federal offices closed for a national day of mourning on Wednesday, and he and first lady Melania Trump will attend the state funeral at 11 a.m. Wednesday at the Washington National Cathedral. Flags on public buildings will fly at half-staff for 30 days. When the G20 leaders put out their statement yesterday renewing their commitment to the Paris climate accord, the United States was the only nation that didn't sign it. Trump has said he will withdraw from the deal, but he technically can’t until 2020 — in fact, the day after the presidential election. And Trump and his top aides have been disputing their own government’s report on climate change to a remarkable degree. 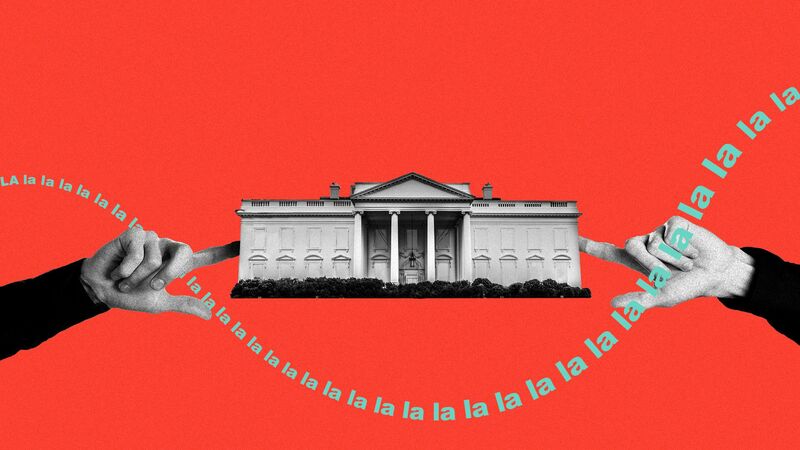 A small but influential set of organizations and people have been pushing misinformation for years — and Trump has been listening. Driving the news: The latest report, which the Trump administration released on Black Friday, is one in a string of consequential new reports reaffirming humans’ impact driving Earth’s temperature up, the consequences of that and how difficult it will be to reverse course. Be smart: On climate science, one side is the scientific consensus, and the other is a small but vocal faction of people trying to fight it. "Many nations are mired in stagnation or sliding that way. Oil prices are falling and factory orders are diminishing, reflecting slackening demand for goods." 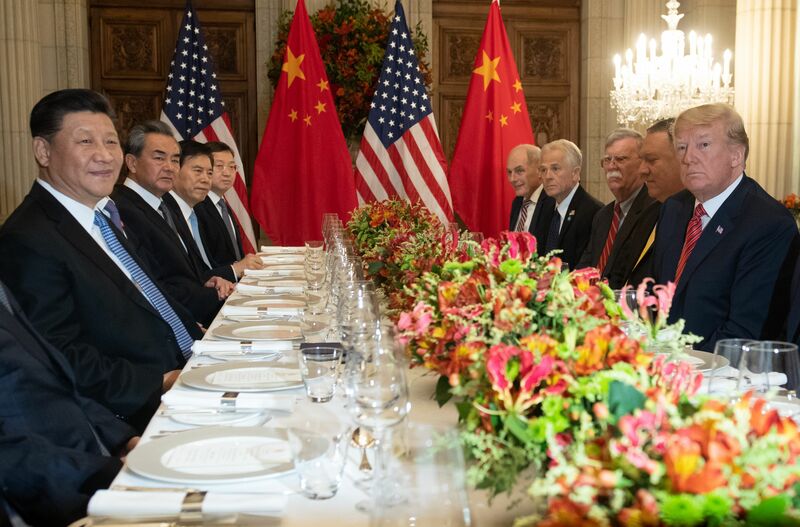 President Trump and Chinese President Xi Jinping "agreed to keep their trade war from escalating with a promise to halt the imposition of new tariffs for 90 days," Bloomberg reports from the G20 summit in Buenos Aires. "The truce ... emerged after a highly anticipated dinner ... between Trump and Xi." "The leaders agreed to pause the introduction of new tariffs and intensify their trade talks." Be smart, from Jonathan Swan: 90 days is a short time. Trump has hedged and could easily reverse. "As the end neared on Friday night," the N.Y. Times' Peter Baker writes, "his son George W. Bush, the former president, who was at his home in Dallas, was put on the speaker phone to say goodbye. He told him that he had been a 'wonderful dad' and that he loved him." 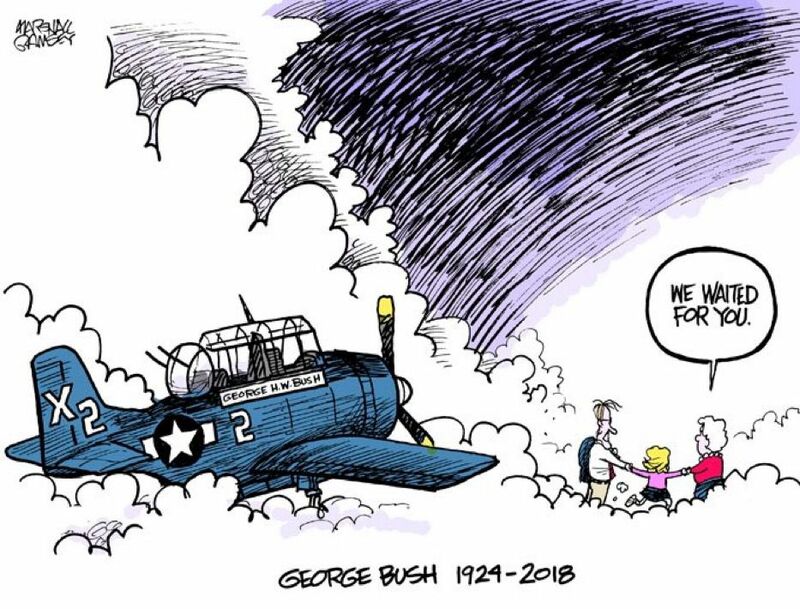 "'I love you, too,' Mr. Bush told his son." "Those were his last words." "Ronan Tynan, the Irish tenor, had called earlier in the day to ask if he could drop by, and when he showed up, [longtime chief of staff Jean] Becker asked him to sing to the president. Mr. Tynan sang two songs, the first 'Silent Night' and the second a Gaelic song." 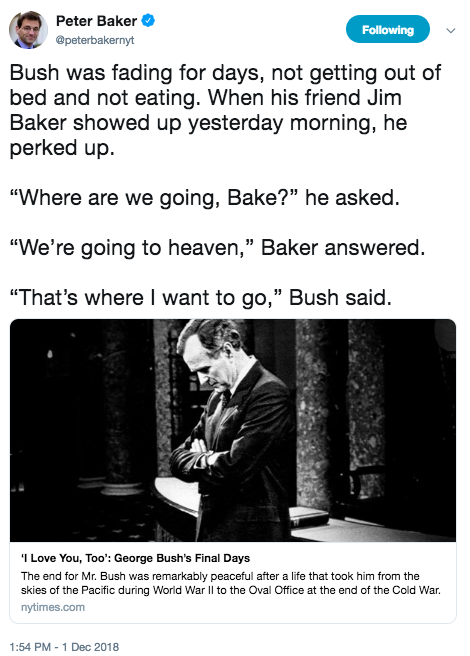 James Addison Baker III, his longtime friend and former secretary of state, "held Mr. Bush’s hand and rubbed his feet for nearly a half-hour. The other children, who live around the country, were called so they could tell their father goodbye." 5. "Hide the forklift! George Bush is a-comin'!'" Marshall Ramsey/Clarion Ledger of Jackson, Miss. "I will never forget the first time I ever interviewed him. ... In 1980, [he] won the Iowa caucuses and beat Reagan ... And he was on CBS the next morning and I said: 'So, how do ya feel?' He said: 'I feel like I've got big mo!' And I said: 'What?' He said: 'Big mo! Big mo!'" "I'd never heard this term, and I said: 'I'm sorry, I don't know what you mean.' He said: "Mo! Mo! Mo! Momentum! I've got big momentum.' And I said, 'Oh.'" "They redid the campaign; they went to New Hampshire. And the way they decided to make him be more manly, as it were, is he abandoned the coat and tie, started wearing trucker, tractor hats and windbreakers and things like that — and drove every piece of heavy machinery he could find in New Hampshire." "Somebody said to me: 'Hide the forklift, Mama! George Bush is a-comin'!'" "He would drive tractors. He would drive snow plows. And once, he drove this 18-wheeler truck. He only drove it around a parking lot and the Secret Service was hanging off the side. But he was driving around out there, tooting the horn. 'Honk! Honk!' he would go. And the thing is, American politics being what it is, he won! He beat Bob Dole and went on to get the nomination." "He probably had more friends than any president I ever knew.," Schieffer continued. "He didn't write his own biography ... But he never lost the opportunity to write people a thank-you note, and there must be a million of 'em out there." 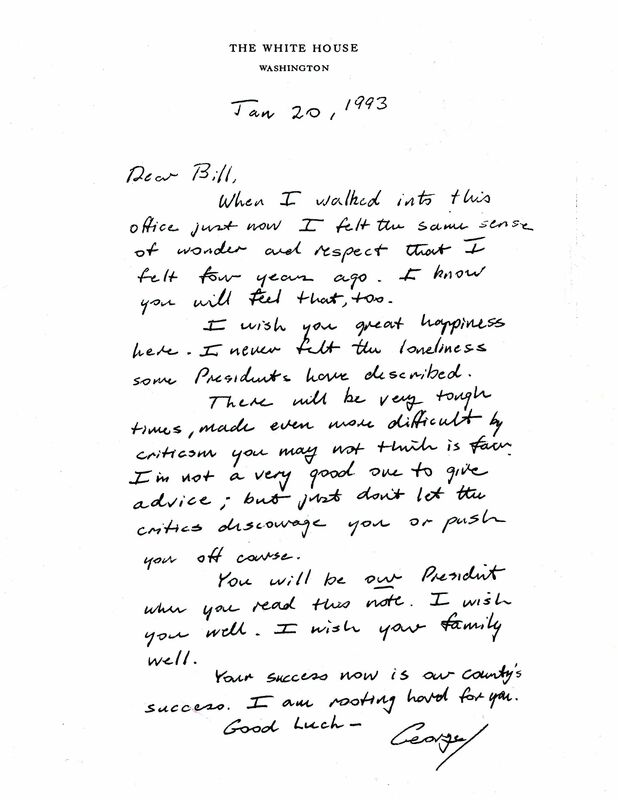 On March 4, 1980, George H.W. 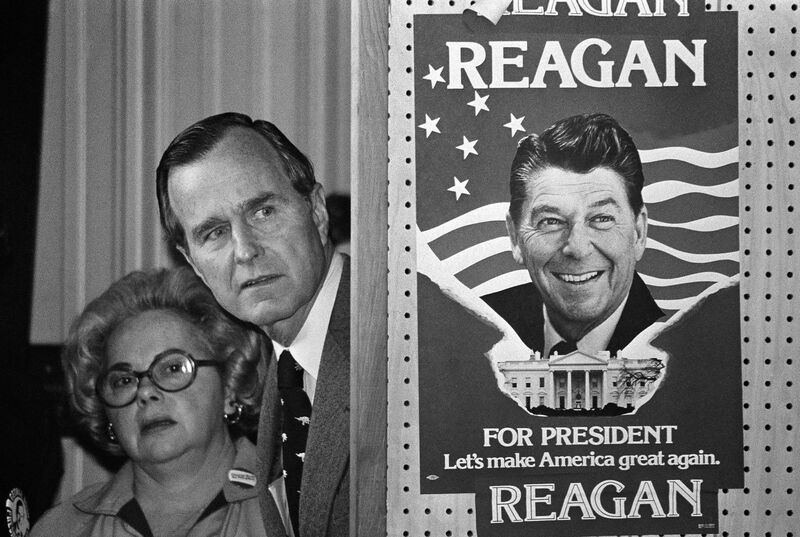 Bush and an unidentified woman peek around a partition with a poster of Ronald Reagan, one of his opponents for the Republican nomination, before he speaks in Columbia, S.C. 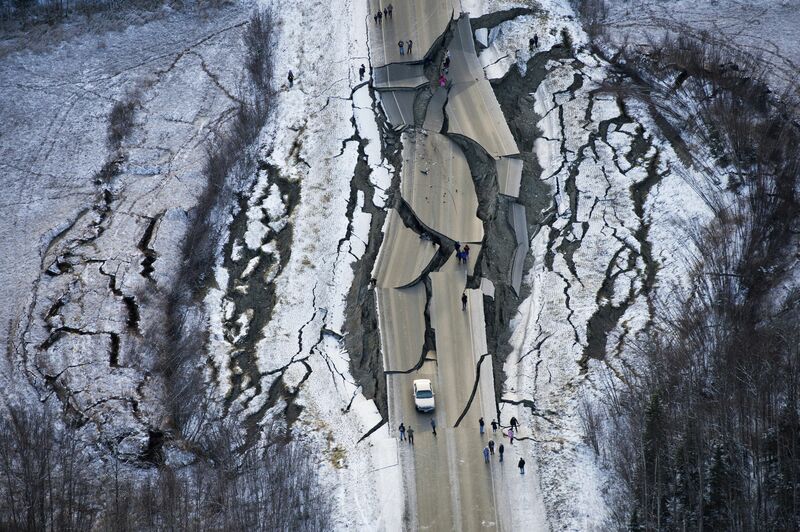 This aerial photo shows damage near Wasilla, Alaska, north of Anchorage, after earthquakes on Friday measuring 7.0 and 5.7. "Rioters ran amok across central Paris [yesterday], torching cars and buildings, looting shops, smashing windows and clashing with police in the worst unrest in more than a decade," Reuters reports. Why it matters: The "escalation in violence after two weeks of nationwide protests against fuel taxes and living costs" poses a "dire challenge to Emmanuel Macron’s presidency." 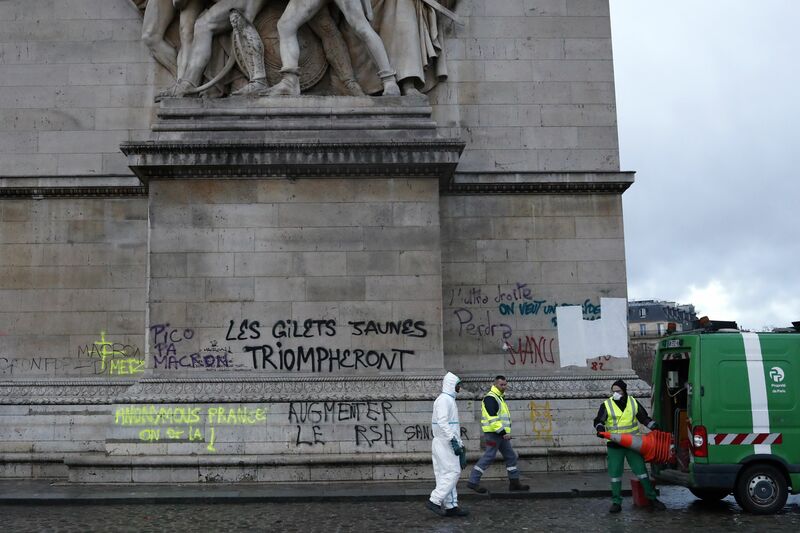 Above, workers today are cleaning graffiti off the base of the Arc de Triomphe, including (in French) "Macron resignation" and "Yellow jackets will triumph." That refers to vests that French motorists are required to keep in the cars, and are now a symbol of the anti-tax protests. Israeli police today recommended that the country's attorney general indict Prime Minister Benjamin Netanyahu and his wife, Sara Netanyahu, for alleged bribery due to their relationship with Israel's leading telecommunication tycoon, Barak Ravid of Israel's Channel 10 news writes for Axios. Why it matters: This is a very big deal. The decisions on the Netanyahu corruption cases will also affect the calculus of the Trump administration as they attempt to determine a release for their Israeli-Palestinian peace plan. What's new: "Case 4000" is the third time in the last year that the police recommended Netanyahu should be indicted for bribery. The previous recommendations dealt with Netanyahu allegedly taking "gifts" worth $200,000 from businessmen in return for allegedly promoting their interests ("Case 1000") and an alleged bribe deal between Netanyahu and Arnon Mozes, the publisher of Israel's largest newspaper and an archenemy of Sheldon Adelson ("Case 2000"). What's next: Attorney General Avichai Mandelblitt, who was until few years ago Netanyahu's cabinet secretary, will decide in the next three to four months whether to indict Netanyahu and his wife in the three corruption cases. 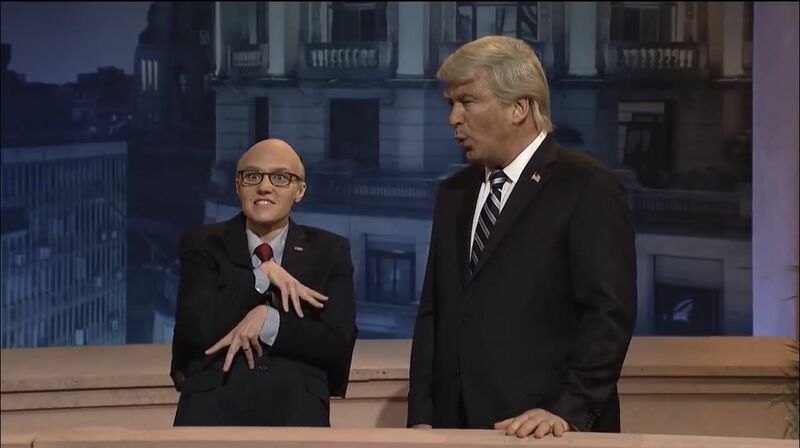 Earlier, "Trump" brooded that he can't stop thinking about the Mueller investigation: "Sometimes it almost feels like he's coming after me." Baldwin, breaking character, says: "I haven't been this upset since I flipped out over that parking space."